For centuries, the way blood circulated seemed more magic than science, until 1628 when William Harvey described the mechanics by which it flowed against the force of gravity, in his work "De Motu Cordis." Your cardiovascular system pumps and delivers crucial oxygen and nutrients to your entire body. You likely do not think twice about your cardiovascular system when it functions well, but you cannot ignore it if fails to keep up with the demands of exertion. Your heart, arteries, arterioles, capillaries and veins comprise your cardiovascular system. The system's pump is the heart, a muscular organ that contracts and relaxes in a controlled rhythm. A series of on and off signals triggered by hormones such as epinephrine and norepinephrine keep your heartbeats in check. Blood pumped out from your heart carries oxygen and nutrients to your muscles and organs, and takes away carbon dioxide and waste products from them. Your heart has a left and a right side, and each has an upper and lower chamber. Blood enters the upper chambers and then the lower chambers pump blood out. Valves prevent blood from flowing backward when your heart contracts then relaxes. Aerobic exercise such as running or swimming increases your muscles' need for oxygen and nutrients. You breathe deeper and your pulse increases when you engage in moderate to intense aerobic exercise. When you are out of shape, your cardiovascular system cannot adapt quickly in response to your increased exertion and you tire easily. With regular exercise, though, your cardiovascular system evolves and adapts. 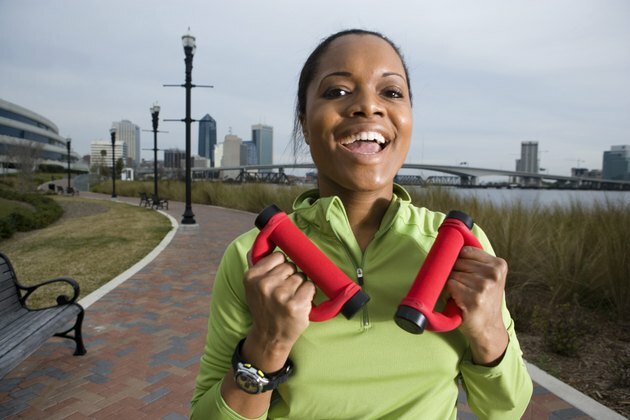 During moderate to intense exercise your heart rate increases, and your heart pumps more blood. As a result, your systolic blood pressure rises and blood volume increases. Systolic pressure quantifies the pressure of blood against your vessel walls as measured when your heart contracts. In healthy young athletes, your diastolic pressure, or your blood pressure as measured between active heart beats, actually drops, because your capillaries and veins relax and dilate somewhat during exercise. The short-term changes in your cardiovascular system return to their resting state when you rest. Long-term benefits of exercise include lower resting heart rate and blood pressure, better circulation to extremities thanks to formation of new capillaries and a quick recovery of resting heart rate after vigorous exertion. Certain conditions interfere with your cardiovascular system's ability to adapt to the demands of exercise. Chronic, uncontrolled blood pressure damages vessels and leads to plaque-filled arteries. The plugged blood vessels limit available blood flow and, as a result, your muscles do not receive adequate blood supply and cramping results. Serious problems occur when coronary arteries narrow and you experience pain on exertion. Tell your doctor if you experience chest pain or pressure when you exercise. Does Exercise Raise Blood Pressure?